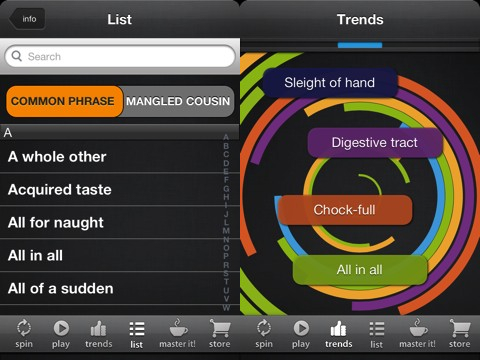 PhraseWit’s iPhone, iPod Touch, and iPad app is a clever, fun educational app to test your knowledge of complicated and nuanced phrases frequently used by Americans. Are you a word nerd who knows “irregardless” isn’t a word? Do you like to test your knowledge of phrases and their proper usage? Are you in the marketing business and post every misspelling and misuse on your Facebook page? The best feature of the PhraseWit iPhone, iPod Touch, and iPad app is the game accessed via the play icon. A sentence with a blank for the phrase fills the top of the screen. You have four selections from which to choose. When you make an appropriate selection, you earn points and the phrase is placed in your master list. There is a clock at the top of the screen, but it doesn’t seem to influence the game play. It expired and restarted on several occasions with little rhyme or reason. When you have demonstrated your knowledge of the first level of phrases, then you can start directly to plug away at the next level. 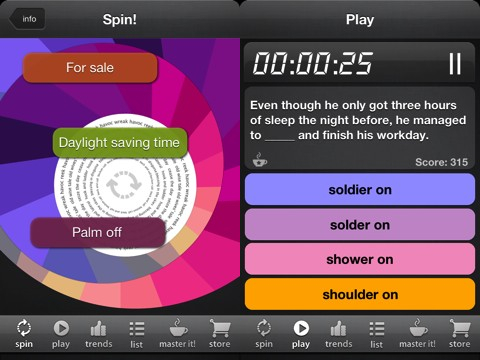 The PhraseWit iPhone, iPod Touch, and iPad app is nerdy fun, and it is reasonably priced at $0.99. More importantly, the PhraseWit iOS app successfully blends education and fun in a sophisticated, easily shared packaged. AppSafari review of PhraseWit was written by Jenni Ward on June 7th, 2012 and categorized under App Store, Education, Fun, iPad apps, Universal. Page viewed 5092 times, 1 so far today. Need help on using these apps? Please read the Help Page. I’ve had this app for a year. It looks good and works well mostly. It has limited content and share doesn’t work (at least with Twitter). I’m surprised the reviewer didn’t mention this.